They carried gifts and condolences for the family of a woman they call a "hero." A caravan of Syrian-Americans stopped on Long Island Friday to deliver gifts and condolences to the mother of Marie Colvin, the journalist who was killed covering the fighting in Syria. The Marie Colvin Convoy for Freedom of Syria group members exchanged hugs with Rosemarie Colvin at her East Norwich home, then presented her with flowers and a plaque at a nearby Oyster Bay park where Marie Colvin sailed as a young girl. "Your loss is our loss," said group member, Omar Chamaa. "Other people are taking up the cause my daughter did, to bring out the truth about Syria and make her life meaningful," said Rosemarie Colvin. Marie Colvin, 56, was killed Feb. 22 when government-fired rockets struck the home where she and other journalists were staying in the Syrian city of Homs. A French photographer, Remi Ochlik, also perished in the attack. Colvin had been reporting on the Syrian conflict for the Sunday Times of London, and appeared on CNN shortly before the deadly attack. "We really consider her a hero," said Belal Dalati. "We wanted to make sure she is not forgotten." 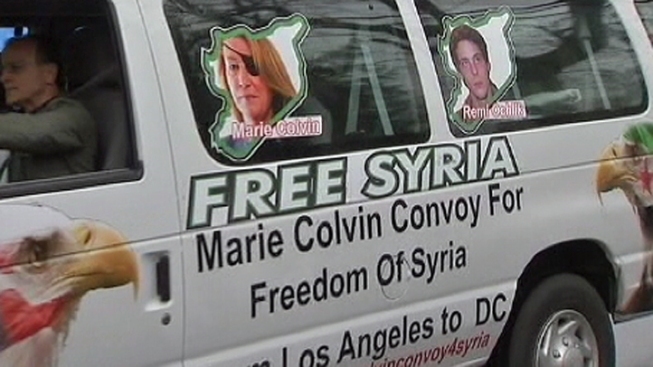 The so-called Colvin Convoy traveled across the country, stopping in 11 cities to raise awareness about the fighting in Syria. The regime of Syrian President Bashar Assad has used its police and military to suppress a yearlong civilian uprising in which the U.N. says more than 8,000 people have been killed. "Nobody is doing anything," said Abed Keddo. "Everybody is just watching and hoping somebody will step in to stop the slaughter." Keddo and others in the caravan spoke of family members still in Syria, who they said face threats every day. The group urged Americans to demand humanitarian help be sent to Syria. "We just hope the message gets out -- stop the slaughter in Syria," said Marie Colvin's sister, Cathleen. "Her death hasn't changed anything. We want the killing to stop."